Born to Giries Baouardy and Mariam Shahine, a poor Greek Melchite Catholic family. Twelve of her thirteen brothers died in infancy, and Mary's birth was an answered prayer to Our Lady. Her parents died when Mary was only two, and she was raised by a paternal uncle. Moved to Alexandria, Egypt at age eight. Betrothed in an arranged marriage at age 13, she refused to go along with it, insisting on a religious life. As punishment for her disobedience, her uncle hired her out as a domestic servant, making sure she had the lowest and most menial of jobs. A Muslim servant with whom she worked began to act as her friend with an eye to converting her from Christianity. On 8 September 1858, Mary convinced him she would never abandon her faith; in response he cut her throat and dumped her in an alley. Mary lived, an apparition of the Virgin Mary treated her wound, and she left her uncle's house forever. She supported herself as a domestic, working for a Christian family and praying. In 1860 she moved in with the Sisters of Saint Joseph. Supernatural events began to occur around her, and the Sisters would not let her join their house. She was taken to the Carmel at Pau by a Sister in 1867, and became a lay sister. Later that year she entered the cloister, taking the name Mary of Jesus Crucified, and making her final profession on 21 November 1871. She continued to experience supernatural events. She fought off a demonic possession for 40 days, received the stigmata, was seen to levitate, had the gift of prophecy and knowledge of consciences, and permitted her guardian angel to speak through her. Helped found the missionary Carmel of Mangalore, India. Returned to France in 1872. Built a Carmelite monastery in Bethlehem in 1875. 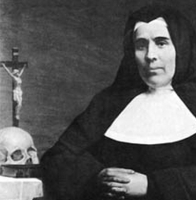 Supernatural gifts aside, she was known for her devotion to the Holy Spirit, even sending word to Pope Pius IX that the Spirit was not emphasized enough in seminaries. 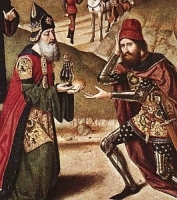 King of Salem, most probably Jerusalem, and a priest of the Most High God. He came to meet Abram after his victory over Chodorlahomor and his allies (Genesis 14), and on this occasion brought forth bread and wine, blessed Abram, thanked God for the victory, and received tithes of all the spoils. The “bringing forth bread and wine” is interpreted by all the Fathers and Catholic commentators as offering a sacrifice to God, because the phrase which follows, “he was priest of the Most High God,” seems to give the motive why he brought forth bread and wine. According to oriental custom Abram would wish to thank God by sacrifice, and if Melchisedech came to meet Abram because he was a priest of the Most High God, the latter would ask him to offer the sacrifice, and would pay him the tithes for this truly sacerdotal function. Melchisedech is a type of Christ (Psalm 109; Hebrews 7), because of his titles, King of Justice, King of Peace, Priest of the Most High God; and because of his eternal priesthood. Scripture is silent about his lineage, about his birth and death; and in this sense he is “without father, without mother, without genealogy, having neither beginning of days nor end of life” (Hebrews 7). This silence suggests the eternal Son of God and His endless priesthood. He is a type of Christ also because of his superiority to Abram, from whom he received tithes and whom he blessed. In Jewish tradition Melchisedech is commonly identified with Sem; Origen and Didymus held him to have been an angel; some even thought that he Wall an incarnation of the Holy Spirit or the Son of God. Son of Publius, a Roman imperial treasurer; uncle of Saint Fortunatus. Converted by the shipwrecked Saint Paul the Apostle. Roman imperial treasurer upon his father's death. Denounced as a Christian, he was ordered to sacrifice to idols; he refused. He was arrested, stripped of his office, whipped, and exiled to Corinth where he met up with Saint Paul again. Consecrated as the first bishop of his home town of Lecce, Italy. He returned to the town during the persecutions of Nero, was arrested again, and ordered to denounce Christianity. He refused, and after some time in prison managed to get released. He immediately resumed preaching in the areas of Brindisi and Bari. Martyr. Daughter of Antony Bichier, lord of Agnes, and Marie Augier de Moussac. From ages ten through nineteen she was educated at a convent at Poitiers, France. When her father died, she returned home to keep her family's property from being confiscated by the state. She won the court battle to retain the property, and she and her mother moved to La Guimetiere. The town still suffered the effects of the French Revolution; it didn't even have a priest, much less religious communities. Jeanne Elizabeth gathered the remaining faithful together to pray, read Scripture, and sing hymns. Lived for a while with the Carmelites and the Society of Providence to learn about religious life firsthand. She soon heard of Saint Andrew Fournet, who practiced a similar ministry in a nearby city; in 1797 she met him, and asked for his help. The two quickly became friends, and together founded the Daughters of the Cross of Saint Andrew to care for the sick and the poor, and to help educate the people of rural France. Jeanne Elizabeth was the first superior of the community, and by 1830 the community had sixty houses scattered throughout France. A men's congregation, Priests of the Sacred Heart of Betherran was formed alongside the Daughters. Daughter of Angiolo Corsini, a royal army captain of grenadiers, and Giulia Salvi. Due to her father's military postings, she lived in the Italian cities of Pistioa, Florence, Arrezo and Rome by the time Maria was nine. Initially enrolled in a Rome parochial school, her father transferred Maria to public school after one of the nuns bad-mouthed the king. She served as a volunteer Red Cross nurse during World War I. Catechist to women parishioners. Married to Blessed Luigi Beltrame Quattrocchi. Mother of four. During World War II, their home became a shelter for refugees. Professor, and writer on education. Member of Women's Catholic Action. Noted speaker to women's lay groups. Widow. 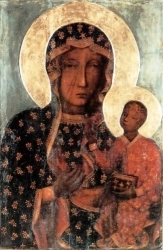 A revered four-foot high, wood and canvas icon of the Blessed Virgin Mary housed at the Jasna Góra Monastery in Czestochowa, Poland. In the image, Mary, dressed in fleur-de-lis robes, directs attention away from herself and toward Jesus. The Child Jesus raises his right hand in a blessing to the viewer while holding the gospels in his left hand. It was created by an unknown artist some time prior to 1430, possibly as early as the 6th century; it was badly damaged by Hussite raiders in 1430 and had to be restored. The images is credited with saving the Jasna Góra Monastery from invading Swedes. King John II Casimer crowned the images as Queen and Protector of Poland on 1 April 1652. Pope Clement XI issued a Canonical Coronation of the image on 8 September 1717. Another Canonical Coronation was issued on 22 May 1910 by Pope Pius X. Yet another was issued by Pope John Paul II on 26 August 2005. 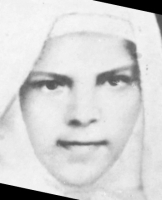 Youngest of four children of Francisco Más and Vicenta Ginestar. Joined the Franciscan Capuchins on 1 August 1893 at the convent of Saint Mary Magdalen in Massamagrell, Spain, and made his perpetual vows on 8 August 1897. Priest, ordained on 22 December 1900 in Ollería, Spain. Working primarily in youth ministery and catechesis, he was know for his strict personal adherence to the Rule of his Order. Martyred in the Spanish Civil War. Imperial Roman centurian, possibly in the Theban Legion. Martyred both for his faith, and probably for refusing to martyr other Christians. Legend says that he fled his legion, had a series of captures and narrow escapes, preaching on the run and converting many before finally being caught and beheaded, but those documents are likely pious fiction. Greek Catholic. Entered the Sisters of Saint Joseph in 1931, taking her vows in 1933. Arrested for her faith by the NKVD in 1951, and sent to Borislav (in the modern Czech Republic), then exiled to Tomsk, Siberia. She contracted tuberculosis, and was relocated to Kharsk, Siberia on 30 June 1952. Martyr. Born to a family of merchants, Jacques received an education and was known as a lover of books. Joined the Carmelites of the Ancient Observant at age 15. Priest. A popular preacher, his health forced him to limit his mission work. Arrested at the convent at Limoges, France, he was ordered deported to French Guinea, imprisoned on a ship in the harbor of Rochefort, France and left to die as part of the anti-Catholic persecutions of the French Revolution. One of the Martyrs of the Hulks of Rochefort. Jean moved to Italy in 1300, which had been declared a Holy Year. Benedictine hermit in a cave on Mount Caramola, Basilicata, Italy. 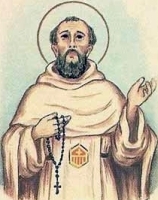 Cistercian lay-brother at the abbey of Santa Maria del Sagittario, Naples, Italy; he was so dedicated to a holy silence that most people thought he was a mute. Miracle worker. Raised on a farm. Teacher at Lérida. Tried to join the religious life, but was refused. 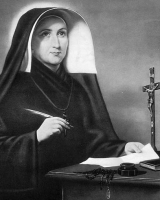 At the suggestion of her spiritual director, she founded the Little Sisters of the Poor at Barbastra on 27 January 1872. The congregation expanded to 58 houses in Teresa's lifetime. Born a wealthy Aquileian noble family. After reading Saint Paul's advice to the Thessalonians that it's best to work with your hands, he became a fuller at Spalato, Dalmatia (modern Split, Croatia). Martyred in the persecutions of Diocletian when he painted a cross on his shop door and openly practised his faith. Son of a building contractor. Studied in Rocafort, Barcelona, Spain and Campello, Alicante, Spain. Salesian brother, making his vows in 1928 in Sarrla, Spain. Studied theology at the Gregorian University in Rome, Italy. Martyred in the Spanish Civil War. Raised to be a soldier, and served as a knight at the court of the Count of Brionne, France. He left the life of arms to found a monastery on his estate at Bonneville, France. Benedictine monk. Abbot at Bonneville. Moved his community to a new home on the banks of the River Bec in 1040. Abbot to Archbishop Lanfranc and Saint Anselm of Canterbury; the three together made their house a center of learning in Christendom. 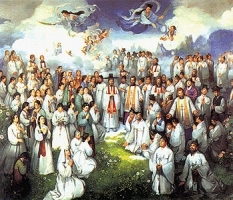 Layman martyr in the apostolic vicariate of Korea. Mercedarian friar. Elected Master General of the Mercedarians on 8 September 1492; he served for 21 years. Founded several monasteries in Spain and northern Africa. Noted for his personal piety in the midst of his administrative and missionary work. Benedictine Vallumbrosan nun at Saint John the Evangelist convent near Florence, Italy, where she eventually became abbess. Spiritual student of Saint Humilitas. Married layman in the diocese of Fukuoka, Japan. Martyr. Noted spiritual teacher. Archbishop of Canterbury, England in 759. Received the pallium from Pope Paul I in 761. Bregwin's letters to Saint Lull of Mainz survive. Hermit near Burgos, Spain. At the command of an angel, he returned to Cereza, Spain to preach Christianity to the Moors who were laying seige to the city. Martyr. Canon regular. Celestine Benedictine at Paris, France. Spiritual director of Saint Colette. Held several offices in his congregation, and worked to establish it in England and the Aragon region of Spain. Soldier. Martyr. Member of the Martyrs of the Theban Legion. Bishop of Auxerre, France in 532; he served for 29 years. Assisted at the four Councils of Orleans. Martyred during the persecutions of Valerian. Fifth-century bishop of Capua, Italy. Archbishop of York, England in the latter 13th century. Nun. The church in Eltisley, England is dedicated to her. Ninth-century hermit in Pistoia, Italy. Monk. Bishop of Syracuse, Sicily. Three Christians, Constantius, Simplicius and Victorinus, martyred in the same area at roughly the same time. That's really all we know, though it didn't stop writers in later centuries from inventing colourful histories, making them a father and sons, adding saintly family members, earthquakes, close escapes, etc.